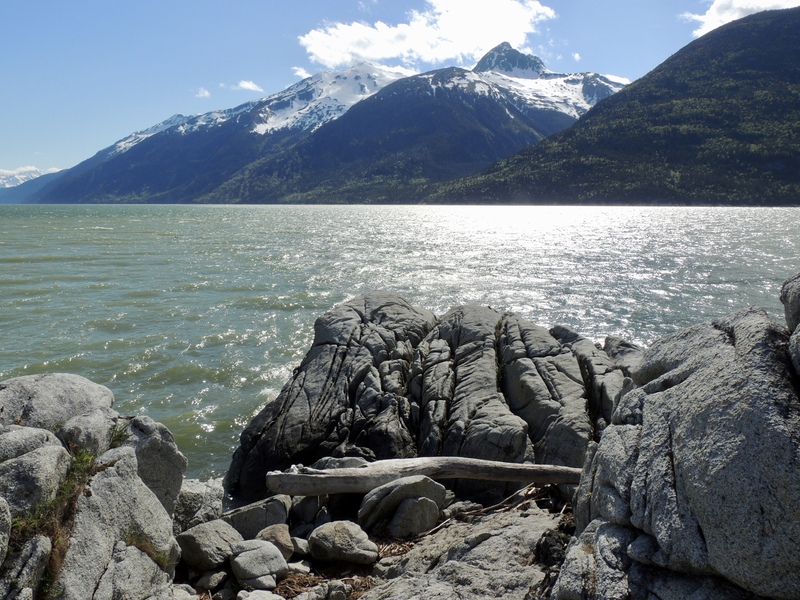 Skagway, once a Klondike gold-rush boomtown, today thrives mainly on tourism. 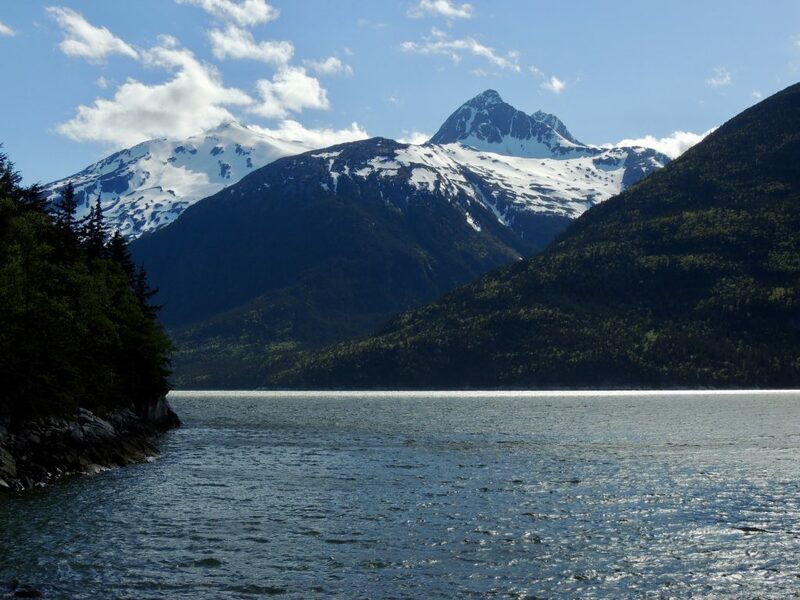 We’d been here twice before on Alaskan cruises, so we’d done many of the day excursions in the area. 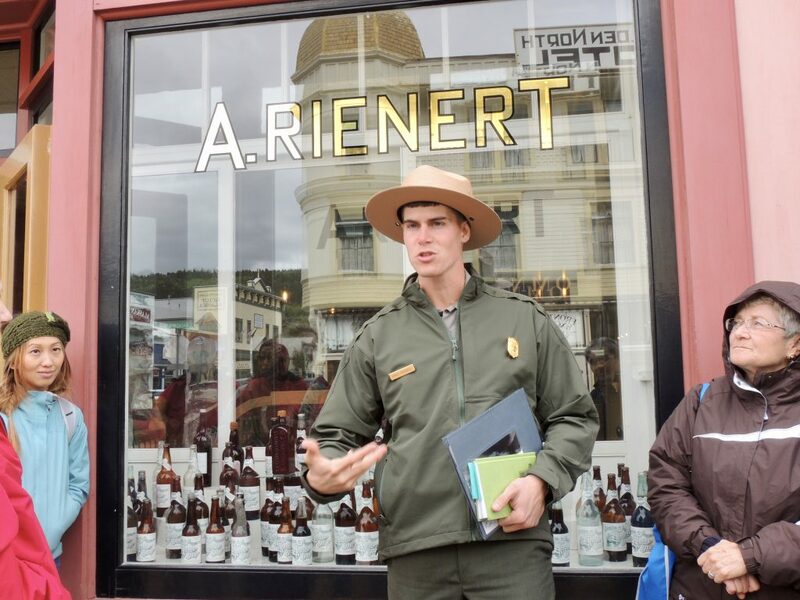 After spending all day yesterday exploring the downtown Klondike Gold Rush National Historical Park on three ranger-led tours, we were ready to get out of the cruise ship passenger-choked town. So this afternoon, we went for a short hike on the Smuggler’s Cove trail. 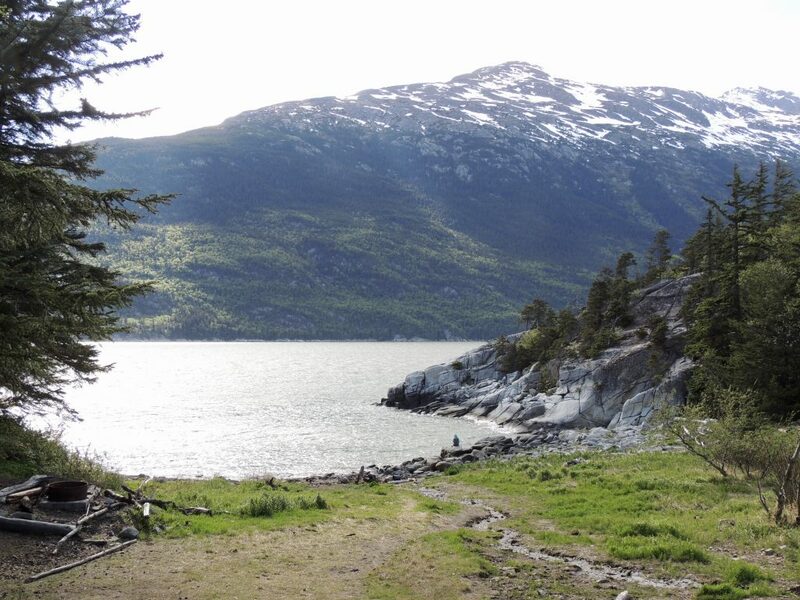 The trailhead is at the edge of the Skagway Airport parking lot, where there are four spaces reserved for hikers–a nice touch. There is a map of the trail system here, but we had also picked up a more detailed map at the National Park Service visitor’s center in town. 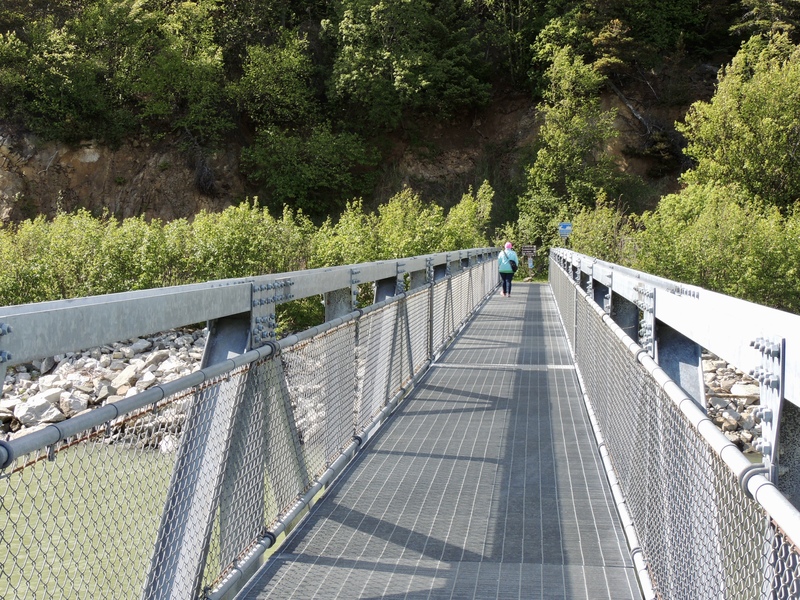 We crossed a pedestrian footbridge over the Skagway River where it empties into the Taiya Inlet. With nothing to stop it, the wind howled up the river valley. I was glad I was wearing my raincoat for wind protection, as the ranger at the National Park Service visitor’s center had suggested. 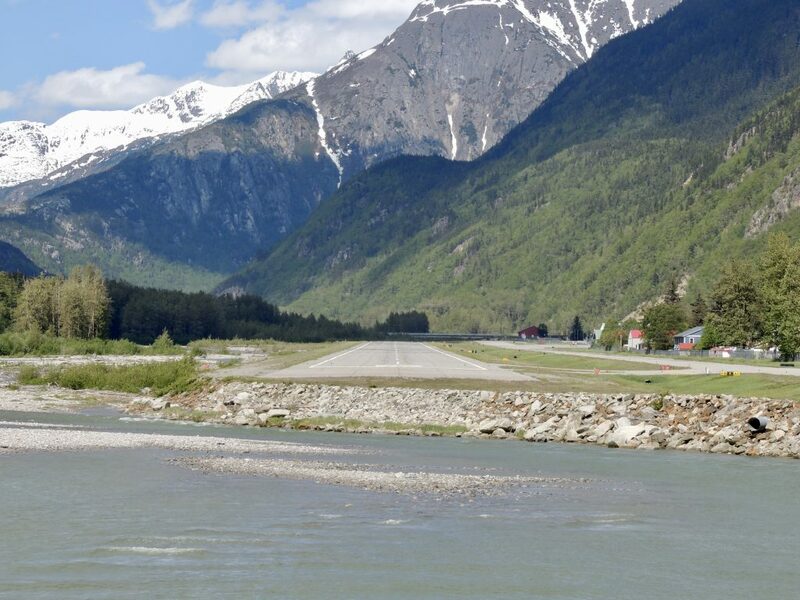 From mid-way across the footbridge, we found ourselves looking right down the centerline of Skagway Airport’s Runway 02/20. On the west side of the bridge, a sign pointed the way to the trails. All of the trails were well-marked with blazes on trees matching the icons on the sign. 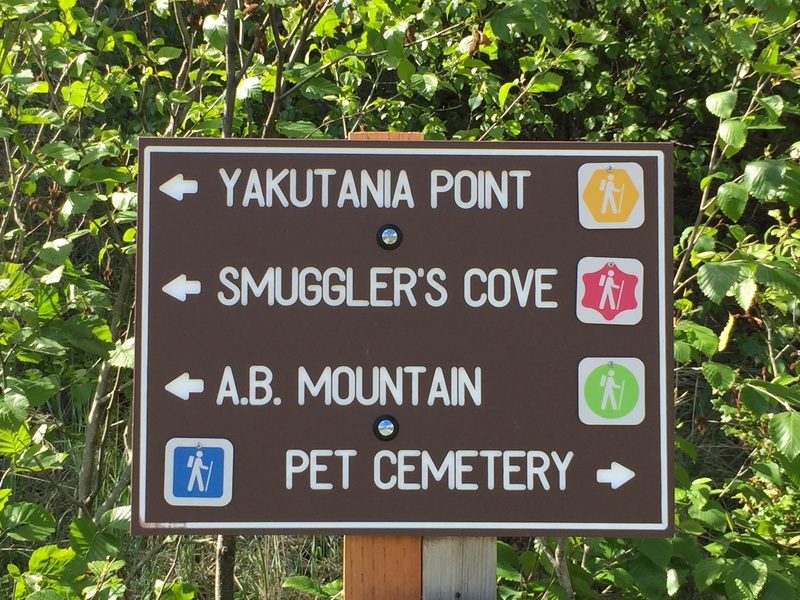 Although the Pet Cemetery was hard to resist, we turned left and headed for Smuggler’s Cove. 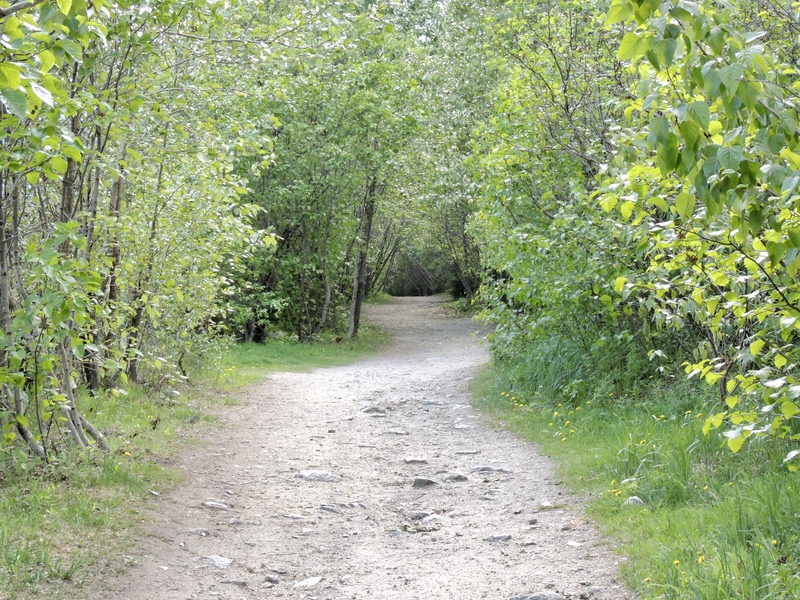 The first portion of the trail was relatively level as it passed through a wooded area. 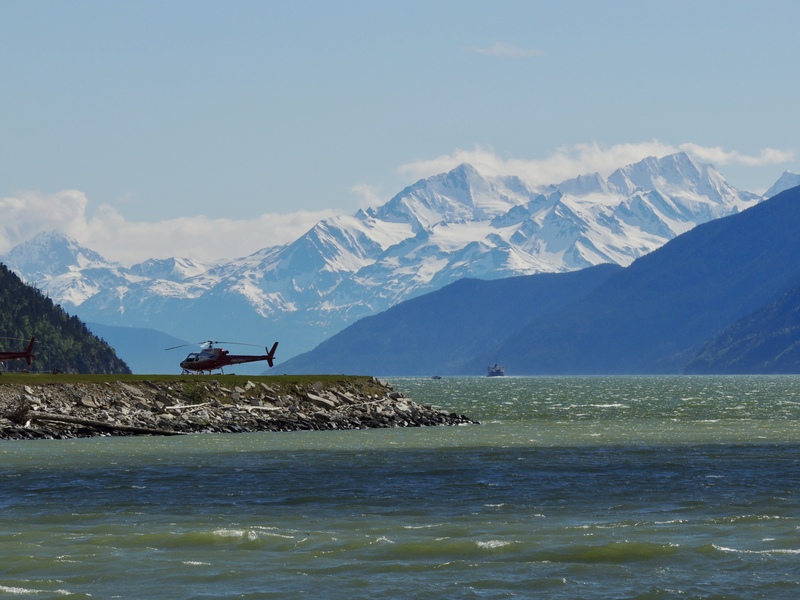 A break in the foliage gave us a view of the Skagway Heliport with the Taiya Inlet and mountains beyond. Helicopter flight-seeing tours are popular shore excursions for cruise ship passengers. 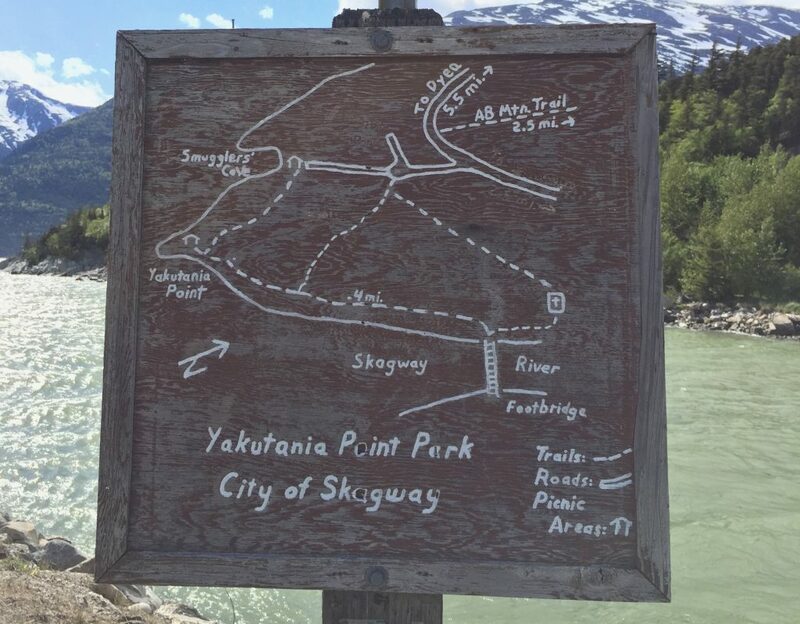 After a bit less than half a mile of walking, we arrived at Yakutania Point, where there is a picnic shelter, fire ring and outhouse toilet so that you can stay for a while and soak up the amazing views. 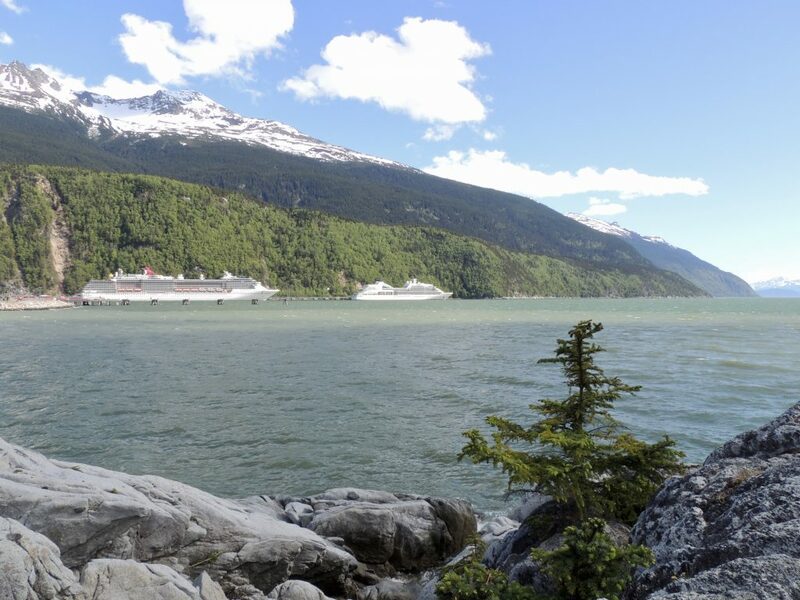 From here, we could also look back at the Carnival Legend and Seabourn Sojourn moored at Skagway’s Railway Dock. The Legend is almost three times as large as the Sojourn, and carries six times as many passengers. 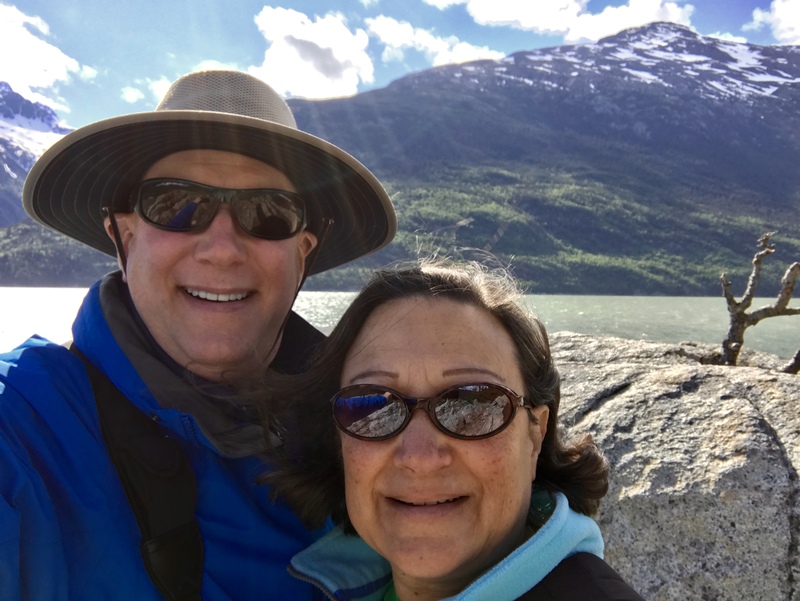 The spectacular water, mountains and sunny sky provided the perfect backdrop for an Alaska selfie. 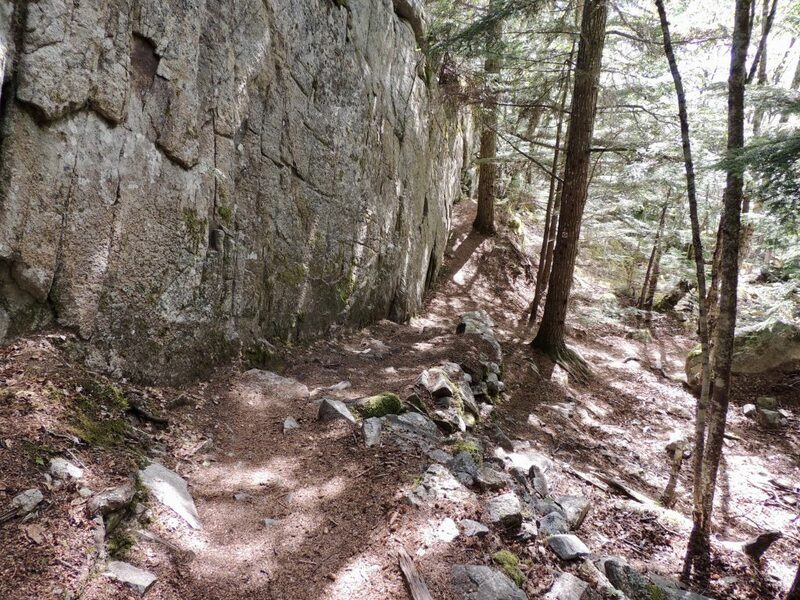 From Yakutania Point, the trail became steeper and more rocky as we climbed about 100 feet before descending again toward Smuggler’s Cove. Two-tenths of a mile later, we found ourselves in the quiet and peaceful grassy flat of Smuggler’s Cove. The views from here, looking a bit further westward, were just as beautiful as the ones we’d seen a few minutes earlier. Leaving Smuggler’s Cove, we retraced our route back to the trailhead at the airport parking lot, for a total hiking distance of about 1.3 miles.